Invisiblemadevisible : UK Street Art & Culture: Nelly Duff's Pick Me Up Zoo! 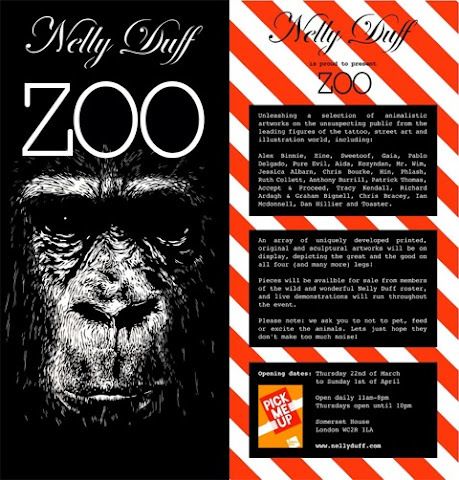 Nelly's ZOO is due to bombard the public with a beast of an exhibition at this years 'Pick Me Up' Graphic Art Fair at Somerset House in London. The kings and queens of the Nelly Duff jungle will be displaying a selection of original artworks & sculpture, as well as the finest traditionally hand-made & limited-edition prints, alongside a 'Daily Specials' programme of artists in residence and design workshops. The show officially kicks off on the 22nd of March- 1st of April from 11am till 8pm, with late night openings every Thursday until 10pm. Let me assure you, this won't be anything you could ever hope to spy over the fences of Regents Park. We will see you there as this is an event not to be missed!